10+ miles The Chapel / Mosquito trailhead is not accessible by car in winter. Roads are plowed only to certain points, and from these spots it is necessary to rely on other means of travel. Some areas of Pictured Rocks National Lakeshore are accessible by snowmobile; other locations forbid any type of motorized vehicle. Cross-country skis would be very handy in some of these areas, as it is sometimes necessary to travel a significant distance on foot, which would normally by covered by car. 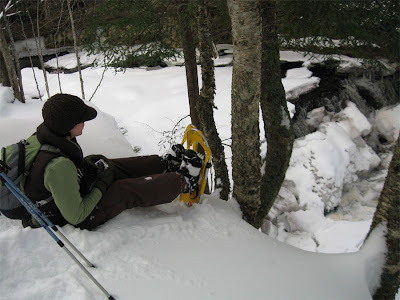 Since I have not yet ventured into the world of skiing, snowshoes would have to suffice when my sister, Andrea, and I set out to hike to the Mosquito River and Falls. On the way to the trailhead. 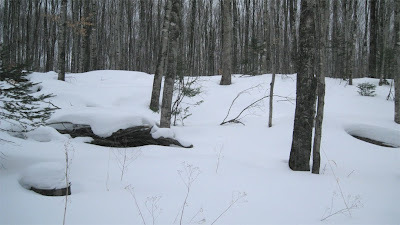 Snow blankets Lake Superior State Forest. Leaving Munising, we headed east on H-58 around 8am. I channeled the stoic nerves of an ice road trucker as I slid around on the solid sheet of snow-covered ice disguised as a road. Luckily, we appeared to be the only people awake and moving about, so we did not have to be careful of other drivers. Also in our favor was the fact that the local deer seemed to be sleeping in. Andrea descends a steep slope into a valley. This was the first time I have driven this route in the winter, and once we entered the birch forest, the scenery became a winter wonderland postcard. Around 9am, we reached the end of the plowed portion of the road and parked off to the side. Based on the park service road closure map, I guessed it was about 3 miles to the Chapel / Mosquito trailhead, where hikers would normally park and begin walking. 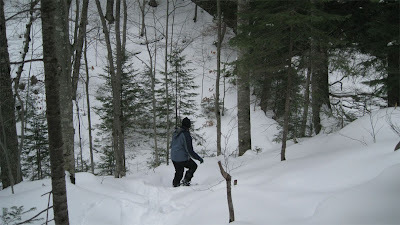 Snowshoes on and trek poles in hand, we left the car behind and continued on foot. A layer of light snow covered older snowshoe and cross-country ski tracks, which looked to be resting atop a layer of snow 18” – 24” deep. After a mile, I was feeling pretty good about being 1/3 of the way there. Then we passed a sign indicating that we still had 3 miles to go. I may need to invest in skis. 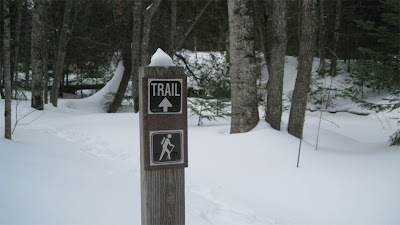 We pressed on, and eventually reached the trailhead where I engaged in my favorite winter challenge: using an outhouse while wearing snowshoes. Foolishly, I was not able to determine how long it took us to reach this point from the car (and, also, how long we would need to get back) because I was not wearing a watch. Although I was fully aware that there is no cell phone reception in this area, I stupidly forgot that this would also affect my phone’s clock. When I pulled my phone from my backpack and found the battery draining while searching hopelessly for a signal (and not displaying the time), I felt like an idiot. I may also need to invest in a watch. 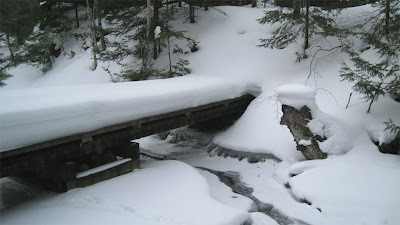 The first section of Mosquito Falls is approximately one mile from the trailhead. I had not hiked this trail in 3 or 4 years, so it was almost a new experience. Luckily, Andrea had been there in autumn and the details were fresh in her mind. For close to ½ mile, no previous tracks were visible, but the fresh snow looked slightly depressed where it had coated the path. The trail is not blazed, however, a nd after the first ½ mile, it disappeared altogether. If I had been alone, I would have had no idea where to go, as the trail climbs ridges, then descends into steep valleys, and the river is not always audible. Andrea knew exactly where to go and led us to the shallow canyon overlooking the first section of Mosquito falls without incident. Due to the steepness of portions of this trail, the crampons on the bottoms of our snowshoes were invaluable and I definitely recommend using trek poles. In warmer months, it is easy to climb down to the river’s edge. 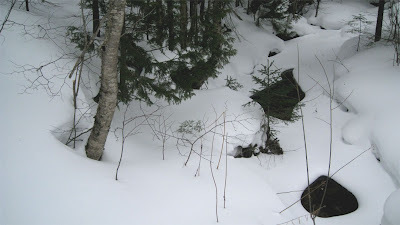 This appeared impossible due to the snow and ice, so we remained at the top of the cliff overlooking the river. Mosquito Falls consists of four small cascades, which are very subtle even in peak season. Icicles hung along the canyon walls, and the heavy blanket of snow did not leave much of the falls visible. 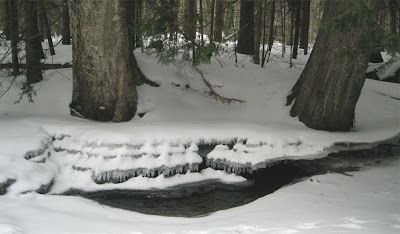 The first section of Mosquito Falls is mostly hidden by snow and ice. 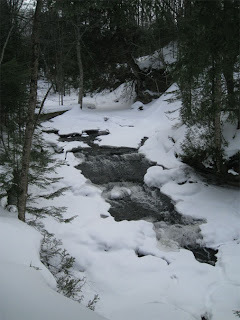 We explored along the river for ½ mile or so, then began the long trek back to the car. Although I did not remember the hike to the trailhead being downhill, the walk back felt like a slight but never-ceasing incline which made the journey a very slow trudge. Andrea is a stronger hiker than I am, and before long she was leaving me in her powdery dust while I wheezed along. We finally reached the car and I was surprised at it being only 3pm. Hiking a little over 10 miles in 6 hours is really not bad at all in snow, especially with much time spent gazing at the river and taking pictures. We headed back to the motel to eat a quick late lunch before heading back out to visit more icy areas in Munising before the sun went down. That is awesome scenery. I really got to get up north one winter. Thanks for sharing. 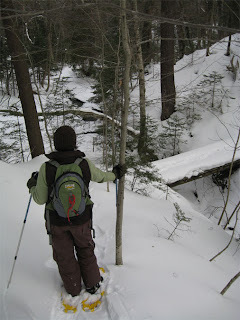 Great post on snowshoeing in Pictured Rocks. Glad you had a great time. Thanks for sharing the photos and video clip! This is my favorite hike in Michigan. So cool to see it in the winter.